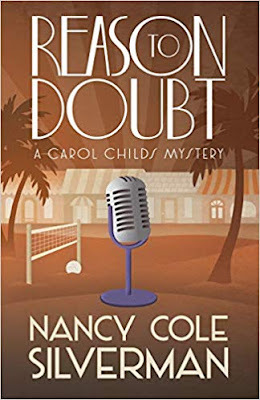 The Carol Childs Mystery series written by Nancy Cole Silverman features Carol, who is a forty-year-old investigative reporter for a talk radio station in Los Angles. The radio part is what first drew me to this series, as I'm a fan of radio programs, including news programs and dramas. Carol takes her job seriously as a narrator of events in the fast-moving world of LA. 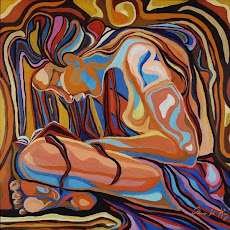 Her determination to be thorough and fair wins her admiration, but in Reason to Doubt, it causes her daughter to accuse her mother of choosing her job over her. For the past seven months, Carol has been involved in the investigation and reporting of the murders of three young models in the LA area. Carol discovered the body of the first victim and was on the scene of the second victim before any other reporters, so she has had an edge over other reporters on this case. She knew that the police were dealing with a serial murderer after the second murder, and the murderer has come to be known as the Model Slayer. The theory is that the Model Slayer is using a photographic session as a lure to get the girls alone and kill them, as photos of them were left scattered at the girls' feet. As fate would have it, Carol's daughter Cate is dating a photographer who happens to have photographed a couple of the girls for their portfolios. The police think he did a final session where he killed the models, and arrest Pete Pompidou on suspicion of murder. Carol's boss, Tyler Hunt, presses her to get the story and bring it to KTLK ahead of the pack. This places Carol in a precarious position with her daughter, but Carol doesn't waiver in her duty to report the news without prejudice. Of course, Cate sees it differently and thinks her mother cares more about her job than her daughter's heartache. Carol can't tell Cate that a confidential source has contacted her, which has led to Carol doubting Pete's guilt, and with Carol's strong instinct for justice and truth, she is pursuing leads that will hopefully exonerate Pete. Carol's source goes by the stage name, her pole-dancing name, of Xstacy, and claims that the Model Slayer is dead, since she ran over him with her van, on purpose. Xstacy swears Carol to silence on the confession that it was an intentional act. The police think it was an accident and haven't connected the dead man with the killings, as Xstacy killed him before they had any reason to suspect him. She, however, heard him talk about the killings and leaving the photographs at the scene, something the police hadn't let out to the public yet. Also in the loop about the demise of the man is a college girl with the stage name of Jewels who is a friend of Xstacy and helped set up the "accident." Carol certainly has her work cut out for her to prove that the dead man, Ely Wade, was the killer and not Pete, while keeping the identities of her sources secret and safe. Pete is released, but the police still consider him their number one suspect, and when another murder like the Model Slayer's occurs almost right outside his door, the police are sure they have their man, although they think he had an accomplice. Carol is desperate to protect her daughter from the publicity surrounding Pete's re-arrest, and to convince the police they have the wrong man. However, the police are demanding that Carol turn over her confidential informants and all the information given to her. The ability of the press to keep their sources confidential when requested or when revelation might endanger them is crucial to a reporter's job, and Carol is adamant about keeping her word. Again, her resolve causes friction with Cate, but a life definitely depends on Carol's silence. Before the truth is complete, more than one life will depend on Carol putting the right pieces together. Along with Cate, several other people are involved in this complex race to ensure the guilty are caught and the innocent are freed. A recent and brief romantic connection of Carol's, Chase, or Gerhardt Chasen, is called in by Carol's boss, as Chase is a private investigator and could be helpful to Carol's investigations. Carol is aware just how helpful Chase can be, but involved he does become, which proves to be useful. On the opposite side of Carol's pursuits is ex-boyfriend Eric, FBI agent on the case, working for the prosecution and against Pete. Then, there is the delightful Misty Dawn, Carol's psychic housekeeper, who has some reliable insights and is protective of Carol when she senses her friend is in danger. And, of course, there is Carol's best friend Sheri, who has the outfit for any and every occasion, even a trip to the Skylight Bar, where pole-dancing is the preferred choice of entertainment. 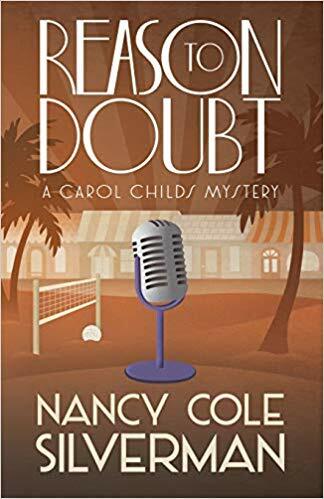 Nancy Cole Silverman has created an engaging and individually interesting cast of characters in this series, and Reason to Doubt showcases all their carefully developed, engaging personalities. Besides great characters, the author keeps the story moving along through clever dialogue, including Carol's silent dialogue that she must keep to herself. 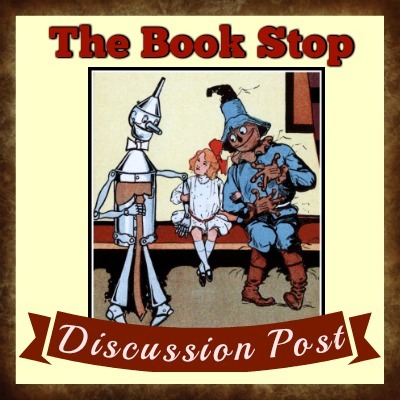 The writing never becomes bogged down in unnecessary detail, and yet the reader will feel as if the scenery is familiar and the characters are old acquaintances. It's quite a coup that Silverman pulls off in relaying how gruesome the murders are without being graphic. She knows how to use her words to convey the message without being messy. The suspense will keep readers on point until the final reveal, which will be surprising but not deceiving. Reason to Doubt is the complete package and will entertain and thrill readers to the end. In full disclosure, I received a copy of this book from the author. I guarantee that my review is an honest and complete one.